This little garden has been a long time coming! I had the idea to do a flower pot pincushion ages ago. I made up a prototype pot but got stuck on what should be growing out of it! That little pot sat on my drawing table for months. Maybe I should’ve watered it or something. 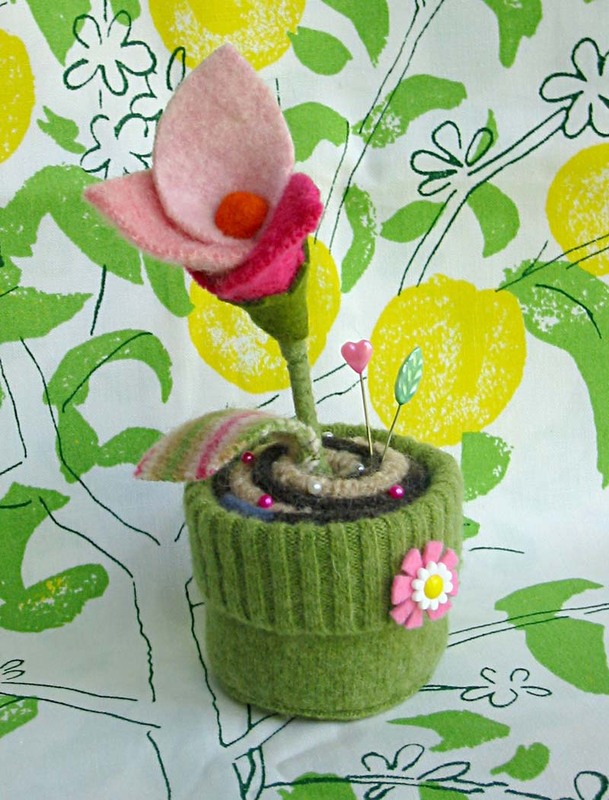 Occassionally, as I was working on various other projects, I’d stick some little felty sprout of something in there. Nothing took. I sketched. I stared at it. Still nothing. 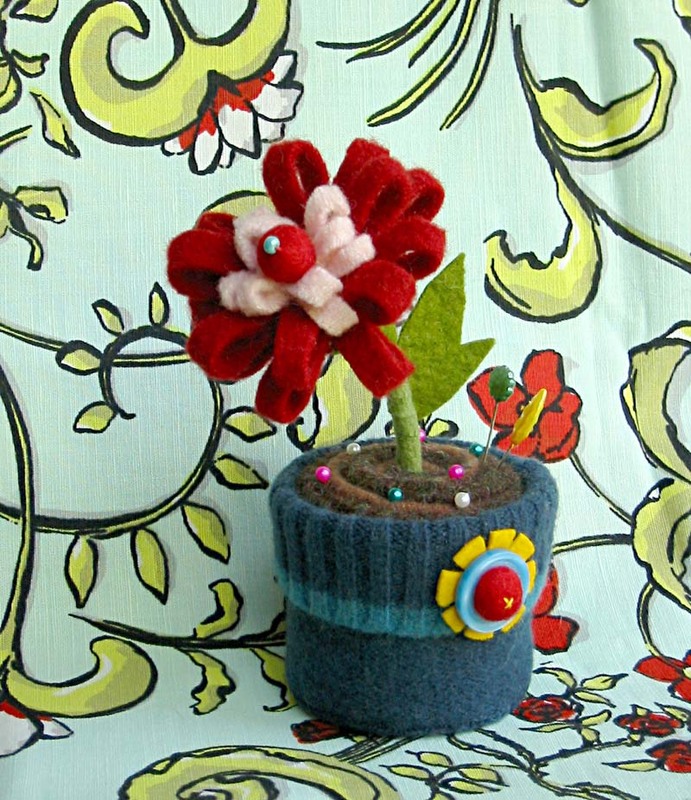 This flower is basically the one I do for my felted brooches. I think it’s a little heavy looking. Maybe less petals next time. And stronger wire in the stem! I like the pokey nature of this flower! I used sweater ribbing and snipped in between the rib lines. This was an attempt at a tulip type flower. Maybe a tulip in Whoville. I like the stripey leaf! I love them, they are so cute. I like the tone-on-tone brown “dirt” and the way the ribbing make the lip of the pot. They’re charming! Too Bloomin’ Cute!!! Love, Love the way you shaped the pot! Oooh- I like the tulip!! Love those, Betz! You are so darn creative, girl! Very nice! I like the ‘tulipy’ one. It is not too heavy and has an interesting shape. I have made a couple of your cupcake pincushions for my sewing room and love them (tho yours are much nicer). In fact I have a huge pile of thrifted and felted sweaters due to finding your blog! The only problem is, all I see when I look at them is cupcakes–a girl can only have so many pincushions. Very cute!! Looks like you are on the right track!! Can’t wait to see your finished product, all your work is FABUlous! I love the Whoville flower! I can’t wait until they are ready. What a great idea! Actually, the tulip is my favorite! I really love it! You are such an inspiration. Thanks! Fantastic! I like them all, but the tulip-y one particularly appeals to me. I love those! I especially like the tulip one. Good luck – can’t wait to see these in your shop! 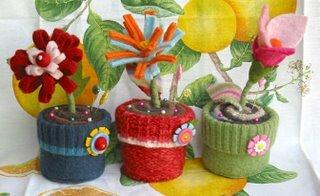 How about a cactus that you can also put the pins in? Just my opinion here, take no offence please. I love the idea! The pot is great. I would leave the front decoration, but I think the pins in the “dirt” make it look too much like your cupcakes and not many pots have sparkles! lol. I would leave the dirt all brown and twirly, that looks cool. I agree with you that the flower is too big – what about 2 or more sprigs and make different types of flowers like low violets or a tall gerbera daisy? Just in purportion to the pot. Can’t wait to see what you come up with! They’re all gorgeous, but I like the tulip best. Pamela. So creative and cute. They’re all wonderful. OH Betz these are DARLING!!!! Now I know why I just couldn’t get those darned tissue paper flowers out of my head – it’s exactly the right thing to have sent to you! everytime visit your blog is so fantastic!! 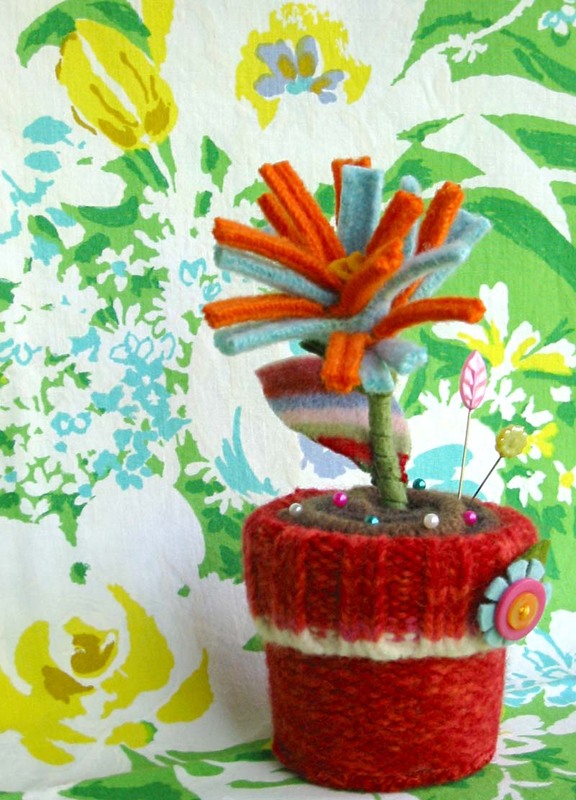 !thanks for showing your wonderful flower pincushion!! !really nice..ciao from Italy!! you are amazing! too too cute. Experiment? I love them all! You’re forever creative as usual and that tutorial is great! Oh they’re gorgeous – they may have taken a while to bloom but it was definitely worth the wait! Dear Betz, I haven’t commented before, but I just want to tell you how beautiful and joyful I think your work is! 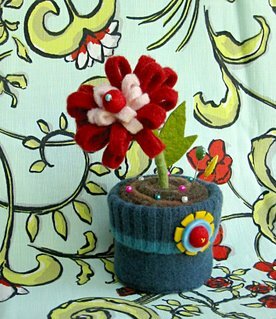 I have just been inspired to make my own cupcake pincushion and now I think I’m addicted to sweater recycling. Thank you for your fabulous designs! I really like the pokey flower one. It just appeals to me! I like the tulip looking one the best. Love Love Love them! Did I mention I love them? I’d love to have you consider submitting for the new Stampington & Company publication, All Things String. Artwork is not due until next year but please keep me in mind. I’m looking for the freshest, funkiest takes on knitting, crocheting, macramé, embroidery, etc. You’re super talented and I love to have you mull it over. Thanks so much!! My favourite is the Tulip one – it’s gotta be the ‘Whoville’ feel and that stripey leaf is too cute! Great addition! – stay light I think, like the tulip.